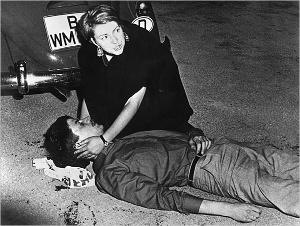 This image, of student protester, Benno Ohnesorg, in slain in 1967, West Germany, by a West German police officer, was one of the images of the cold war that stuck with me. The woman hovering above the poor head shot fellow looks like an angel from one of those paintings at a war memorial cradling a slain soldier. He had been protesting the state visit of the Shah of Iran. The officer, Karl Heinz-Kurras (pictured) was exonerated. 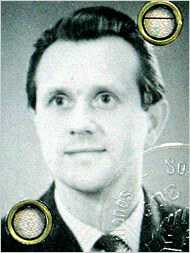 The picture is from Heinz-Kurras’ East German Communist party membership card (NY Times article). He was a member of the East German security apparatus, or Stasi -this being uncovered just this past week. Benno Ohnesorg became the focal point of a lot of activism and social change, but also the beacon for Red Army terrorists. We don’t know if Heinz-Kurras was acting on orders or it was an accident. The news of Dr. George Tiller’s assassination will be another flashpoint in our endless culture war. The far right will probably link this event to some chess move from the left to create a martyr. Certainly we are headed that way from all of the tweets and blog entries I’ve had the stomach to review today, because he is being made into a martyr. I wonder if Dr. Tiller (picture below) had any choice in this. The abortion question is the one issue that threatens our democracy more than anything else because terrorists have acted on their fanaticism. This is our battle -we are in a death match with ignorance. It’s the twenty first century versus the 11th century. Our battle is lost in big ways and little. The big ways have to do with the dilution of excellence, diminishing of expectations and standards, and the coarsening of discourse. The little ways have to do with the choices we make -football practice over violin practice, watching American Idol versus thinking, and buying crap, lots of it. The descendants do descend -I see perfectly well mannered and literate seniors accompanied by less educated and less mannered children and even worse grandchildren. If the greatest generation is on the wane, we are living in a post-Periclean age of reduction. The barbarians are inside the gate. They are us. If we are to get past this, we need to focus on educating, getting people literate in science and the arts. 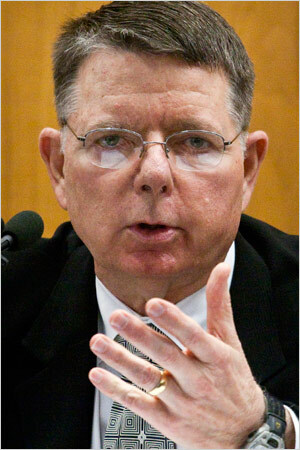 If George Tiller is to become a martyr, let him become a martyr for modernity and the 21st century. 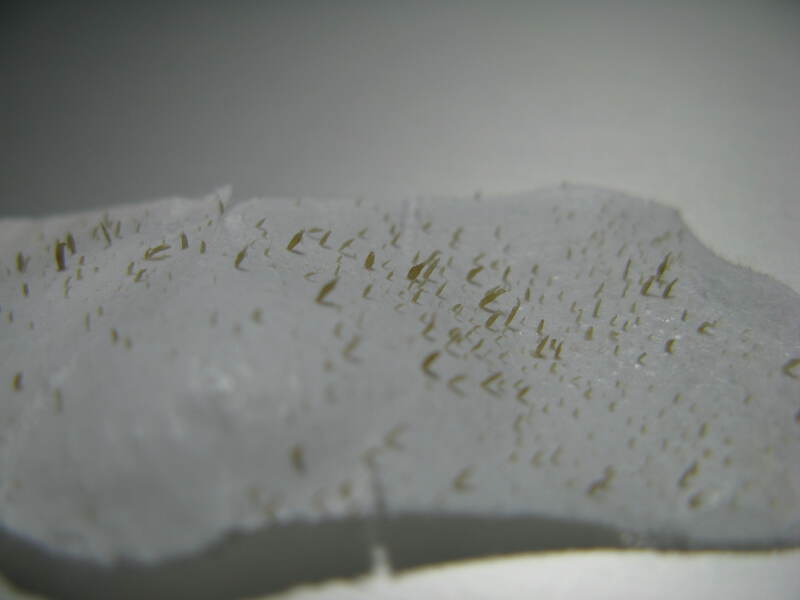 These are comedomes plucked out through the power of a magical adhesive developed by the Japanese firm Bioré, a division of the Kao Corporation. It is truly fascinating to see. My wife encouraged me to try a Bioré when they came out a decade ago, and will intermittently push it on me for some completely mysterious reason. Surprisingly, despite her enthusiasm for it, she is completely grossed out by the process (picture above) and is frankly mortified that I am sharing it. Which leads me to conclude that the mysteries of our fairer counterparts includes this: a fascination/horror with natural processes involving their own bodies. For me, I’m just a few micrograms lighter. My handicap dropped 0.3 points since the last update. My concentrating on the short game while steadying my swing axis is paying off. 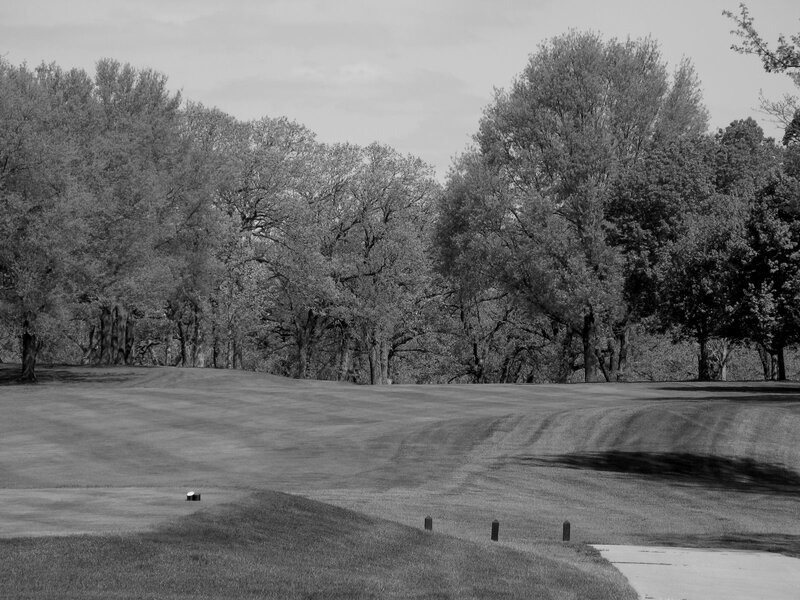 The most recent round of 89 was at Wakonda, and includes two triple bogeys and a double, and I missed three birdies by a hair, so my vanity round would have been to take off 8-11 strokes depending on how vain I felt. Good thing that I am not vain or self absorbed. I was having problems with my View Ti Golf, but the usual fix of removing, resetting, and reloading appears to have fixed it. On my home course, I have made it a practice to keep a notebook of findings, conditions, plays that work, and yardages, so I only rarely use View Ti Golf. It’s when I go to a course that isn’t as well marked and new to me that View Ti Golf shines. My review is linked here. View Ti Golf, which has never given me any funding or support, recently responded to a support query about the same crashing question. I have no reason to believe that it was the program, but the way that the iPhone apps can interact. I have found them to be a gracious, class act. 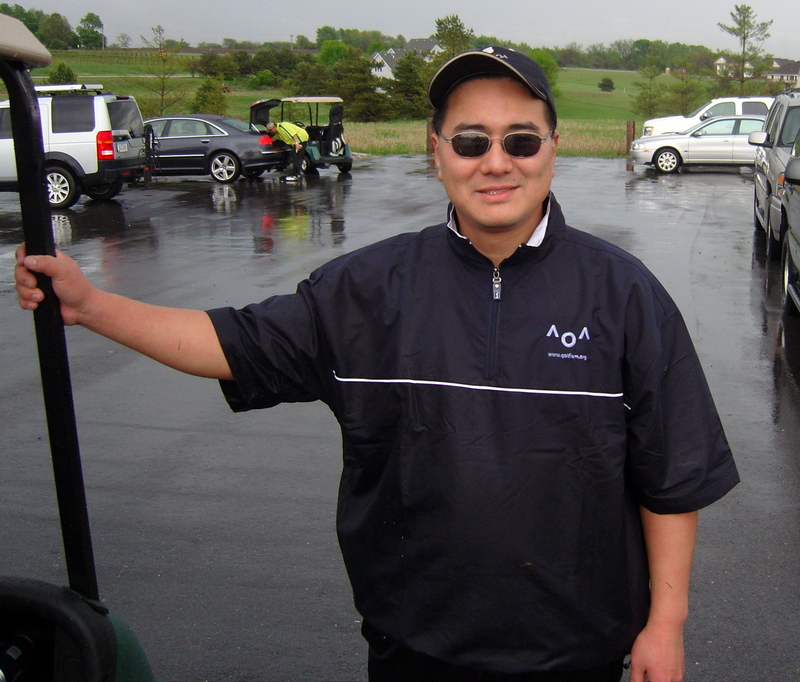 They have given me a free download of View Ti Golf. Which I will give away to a reader who comments below. The contest will close out on 12am of Father’s Day, US Central Daylight time. I will then program my HP15C calculator to generate a random number between 1 and the number of commenters, and I will run this program five times, picking the fifth result. I will post on Father’s day. You have to have a valid email. That’s it. It’s a 25-50 dollar value depending on what they’re doing at the App Store. I am not telepathic, but my wife apparently is. I have corrected eyesight, but apparently no vision, at least for car keys, my wallet, or for my wife’s inner thoughts (see #1). I am one of several things in a list that includes: 3 guppies in a fish tank, several potted plants and shrubbery around the house, my son (he’ll learn), bills, and internal combustion engine maintenance that she has to “take care of.” Gone from the list are our departed beta fish and hermit crab. I suppose I’ll join them one day, out in the garden. I drive too rough, too slow, too fast, and with far too little consideration of others, mostly her. My sense of direction aided by GPS, Google maps, and more GPS cannot possibly match her extraordinary geosynchronicity. There can never be enough retellings of all the family disasters that have occurred from the moment we met regarding my side of the family. She’ll put up with enough golf in my life, but draws the line at the Porsche 911 Turbo 4S in Darth Vader Black -but I really don’t care about that stuff. I’m good for opening jars of jam. She’s suspicious of all the time I spend writing, but generally refuses to read it -finds it boring. My memory for detail regarding emotions, clothing, people know, and minutiae of our intimate life are greatly aided by blogging so that strangers can remember for me. Hi guys. I proposed after a 4 month courtship because I kind of knew no one else would put up with me. I now know that men as they age, if they are without women in their lives in the form of a wife, a girlfriend, or daughter, look like nothing else but homeless men. I know she loves me because she’s still here of her own free will. I’m not as half-witted as she generally makes me out to be -I married her after all. I suppose if they wanted to move the clock forward, they could stock Hai Karate. The amazing thing about these fossil fragrances is how penetrating they are -you can smell it from across the room. The irony is that these after shave lotions are exactly what you don’t want to put on your skin after shaving. 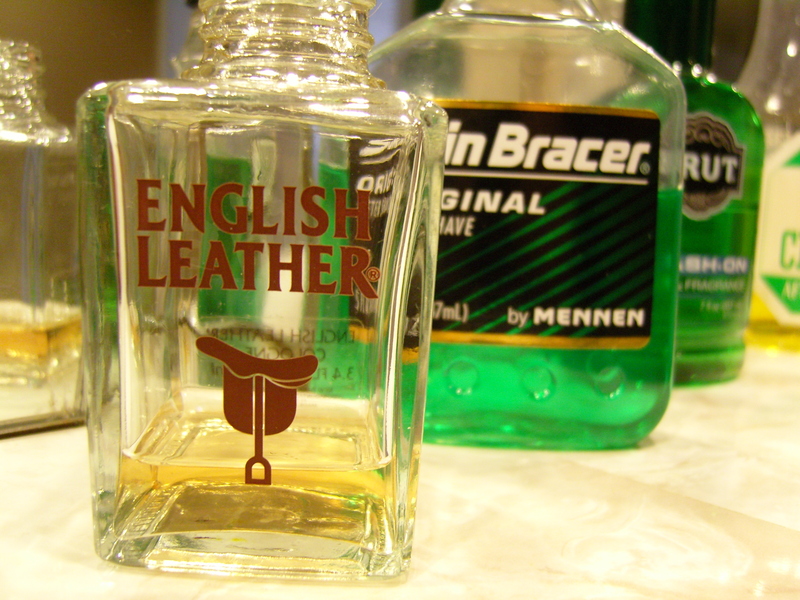 It’s like using aspirin for pain relief -you shouldn’t. It’s a much better antiplatelet agent. My mother had the best use for the stuff -to keep critters away from the garden. addendum 5-19-2009 -sorry about privacy lock that prevented viewing earlier. I had this idea that about performing motion capture of my swing -kind of like the way you see pro golfers to as they get scanned into the games. They usually have white dots taped on all the index parts of their bodies. Using Apple’s Keynote which also lets you record your presentation, I was able to recreate that motion capture. Taking the series of screen shots, I placed dots on the middle of my cap, my shoulders, my hands, and my clubhead, and then took out the picture leaving just the motion capture dots. Keynote has a wonderful and intuitive guide system that makes this very easy. I recently took a lesson from the inimitable Bill Rose, pro emeritus at our course. He has the ability to distill swing advice to a minimal few principles. 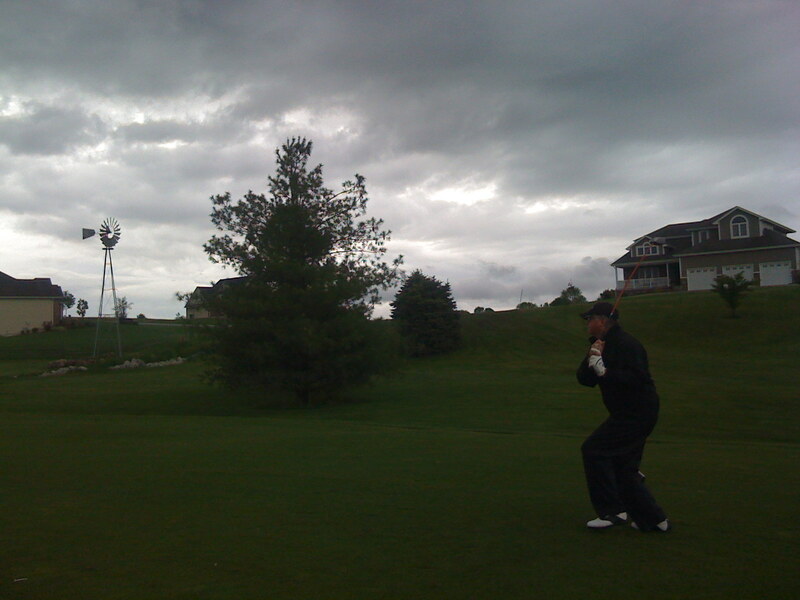 The first thing he said about my swing was about keeping the head still from address to contact. Thin shots -looked up and head went up. Chunks -head went down. I have been able to compensate by moving the hands, and getting contact every once in a while, but never consistently. Strangely, it showed up less in my drives and more in my wedges where missteps seem to be magnified. The video shows what you can do with about 2 hours on the Mac. Taking Mr. Rose’ advice, I spent several hours on the range yesterday evening and found myself hitting in a 5 foot radius around a pin 150 yards away -consistently. Its one of those moments where you just don’t want to leave the range because everything seems to click. Fairway wood -ohmygod -straight, high and mighty. Now if I could get this to go on the course. I will film this modified swing later this season if it holds up. The other adjustment was taking out the last quarter turn that took me past horizontal -hands to right ear with full shoulder turn again kept me in the slot and made it easier to keep my head still. 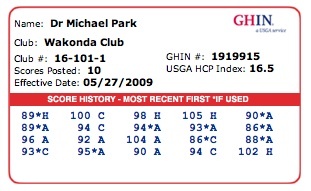 I played Saturday and Sunday on Wakonda -it’s convalescence from a replacement of her greens and fairways now complete. Many trees are gone, more have been planted, and it’s not playing any easier. I was playing in the 80’s and 90’s this spring on other courses. Coming back, I barely got through just 9 holes on Saturday in 38 degree wind chill and 25 mile/hr winds. 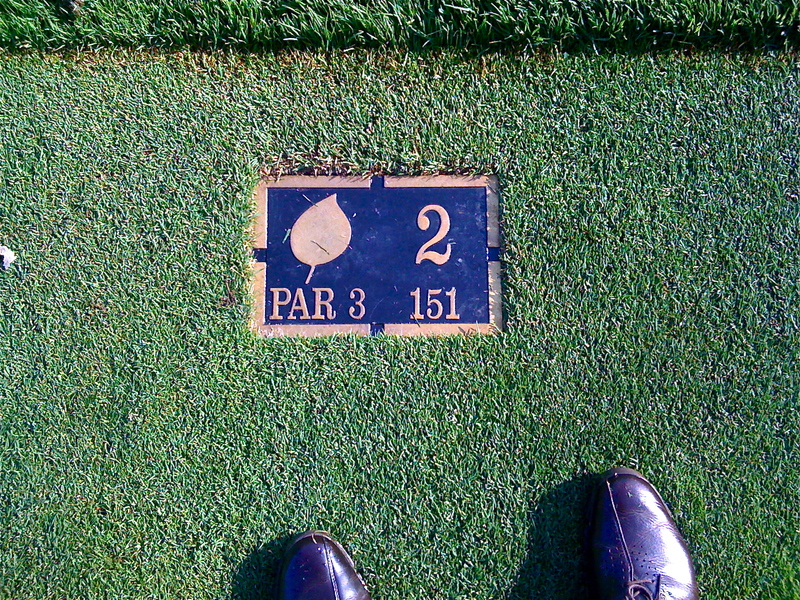 Yesterday, I played in club 2 man best ball -was bested by a pair of brothers, but found a new friend in partner TR. perfectly smooth the grass is and how wicked fast the ball rolls. On 14, a par three with two tiers, my ball on the fringe, on failing to roll up to the second tier, rolled back and off the green. It is like the surface of a very expensive billiard table -the never skipped or jumped but rolled end over end like on a glass surface. The look of the course is sharply different on some of the holes. No. 11 which I blogged about last year (link) had what I termed an oaken shield wall -all gone. The before and afters are below. The hole plays the same, but you can’t rely on underbrush and trees to slow your progress off to the next hole with errant shots. 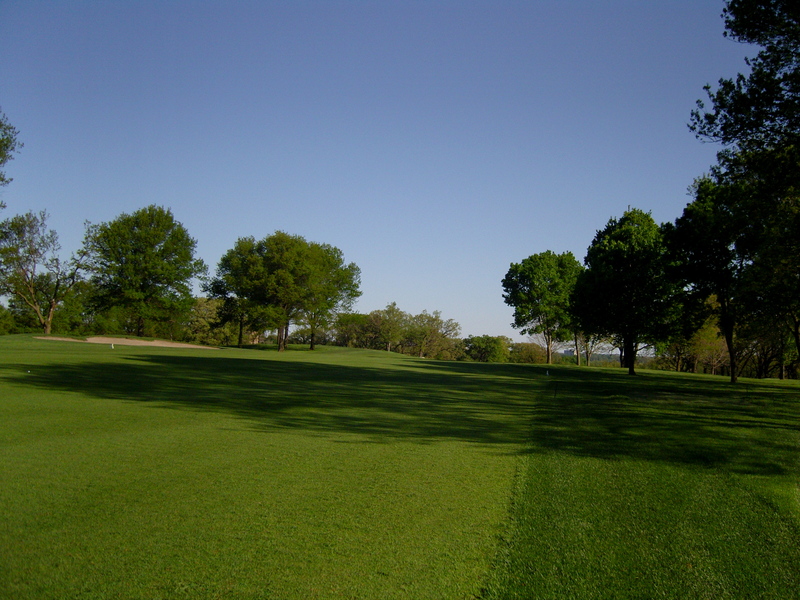 You need a perfect tee shot to the left center onto an ever narrowing fairway to get an uncluttered approach, or if you go right, you have to deal with the tree of despair which, gratifyingly, has been kept with a high fade with a long iron or hybrid. 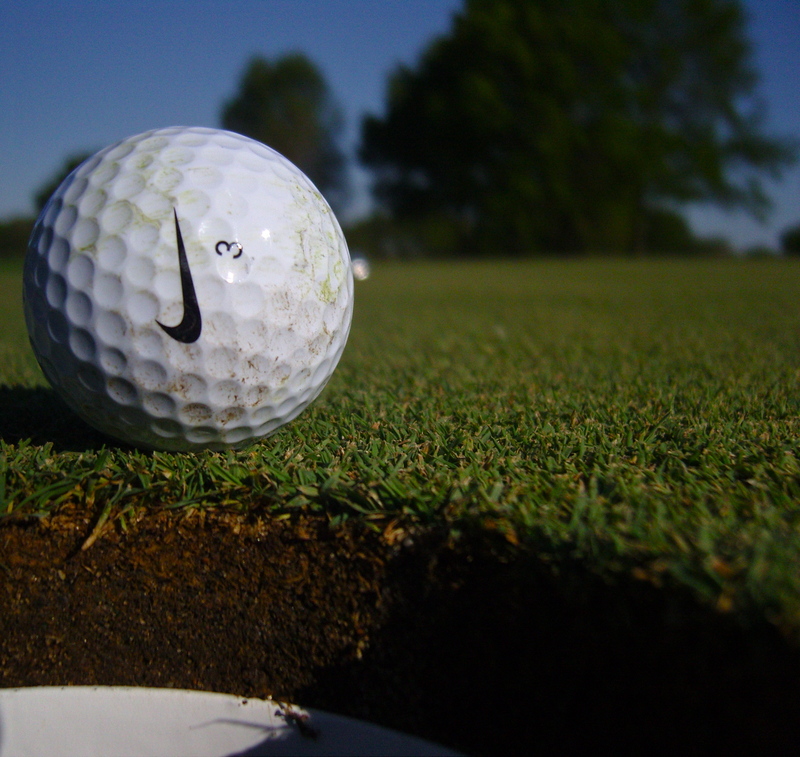 The course remains a relentless test of golf and character with no bailouts, no quarter given. There is no safe place to run up the ball, no place to bail out with a short slice, and no place to ever let your guard down. It’s stunningly beautiful. Wakonda No. 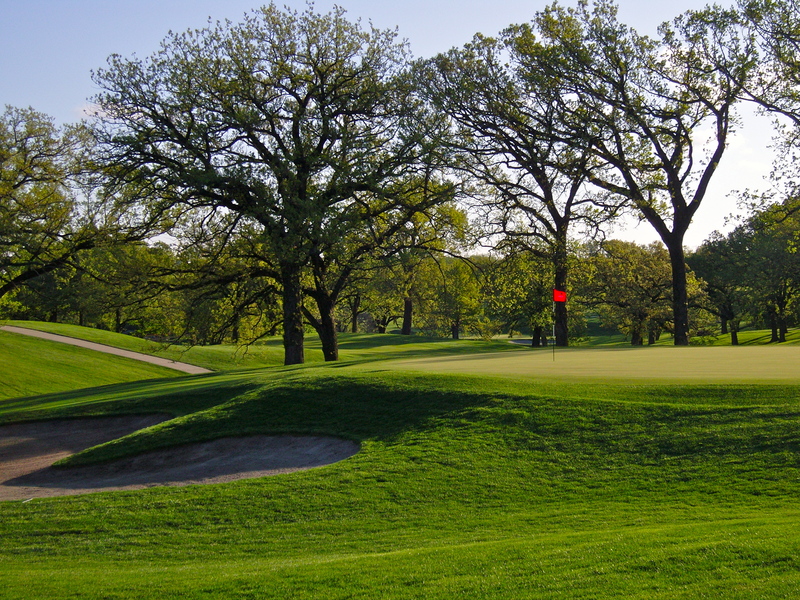 3, third of the toughest starting 3 holes of golf in Des Moines, possibly in Iowa. 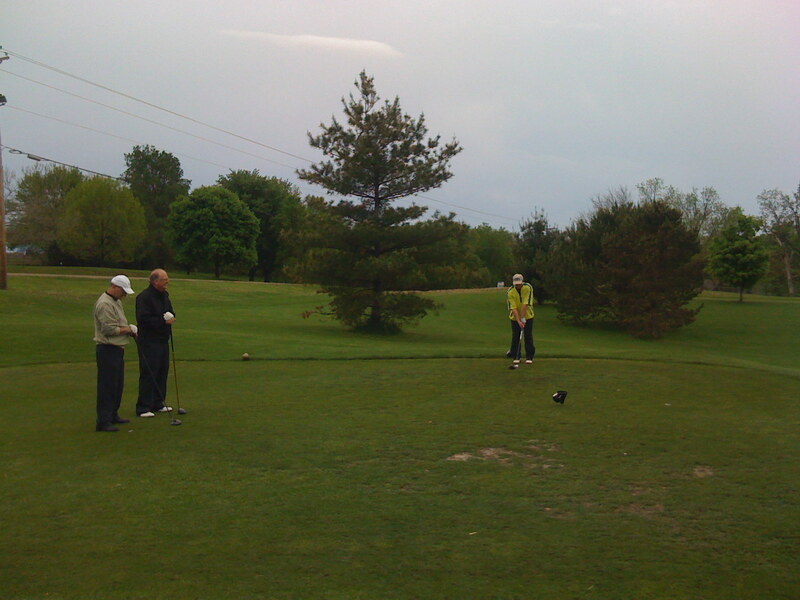 The HAC event was played out at River Valley in Adel, Iowa. It is a gem that is privately owned by the original farmer (who is usually out on his tractor maintaining and will gladly stop for a chat). The weather was drizzly to monsoon downpour-ish. We pressed on knowing that without rain nor wind, it’s not golf (the original Scots is too barbaric for these pages). Everybody finished except for the fellows following us. After we clamored up to the 19th hole soaked to the bone (see picture below left), we were surprised to meet them happily imbibing and chatting. BK gave up on a back nine that found him 1 over through 6 holes, including an incredible series of chip-ins. They saw the rain and felt that it was not worth the trouble -there was lightning in the next county. They were surprised to hear that we finished out, sitting drinking beers dry as kittens and grandmothers. We fought a good fight bringing it in with our heads up -I shot a 90 for the day which is great because of the conditions. 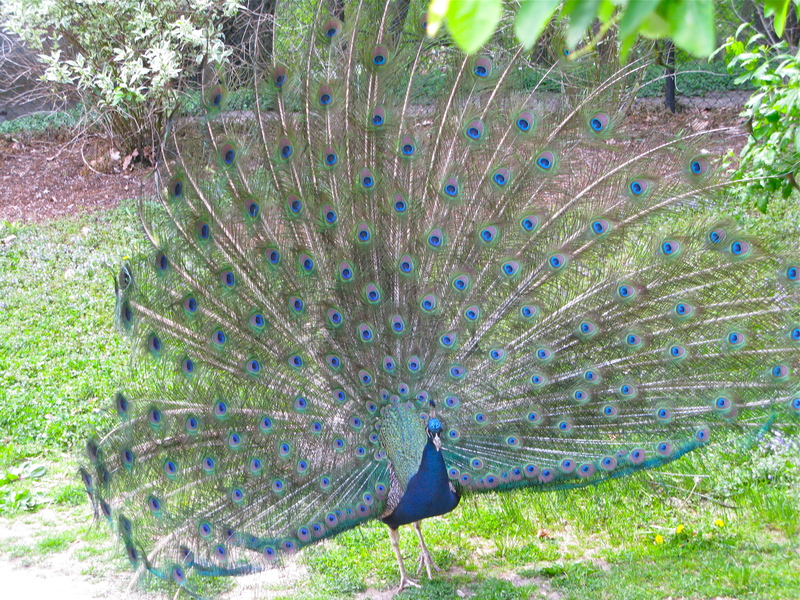 The ball was rooster tailing on the greens. In the midst of the worst of the downpour, facing a 180 yard par three, being unable to see more than 3 feet ahead, I launched my 220 yard club in the general direction of the hole and made it center vector, on the fringe. Not seeing anything but the ball is a great experience. Overall a great half day off from work. So who won? Does it matter? It was a randomized aggregate team best ball over clusters of 6 holes. Teams and post game accounting determined by Mr. A, who emerged victorious! Congratulations! Mowing lawn, listening to iPod, gives you a lot of time to think, and realize things can’t be all that bad…if you live in Iowa, and just played golf that morning. Our match played among 20 of our esteemed neighbors is tomorrow afternoon. Its suppose to be fine weather. Game format and rules? -haven’t a clue. Too excited to start playing at all. I have hit more practice balls this winter than all my previous years -here’s to hoping it paid off. Wakonda Club opens with its newly resurfaced greens and fairways. Many old growth trees have been felled. 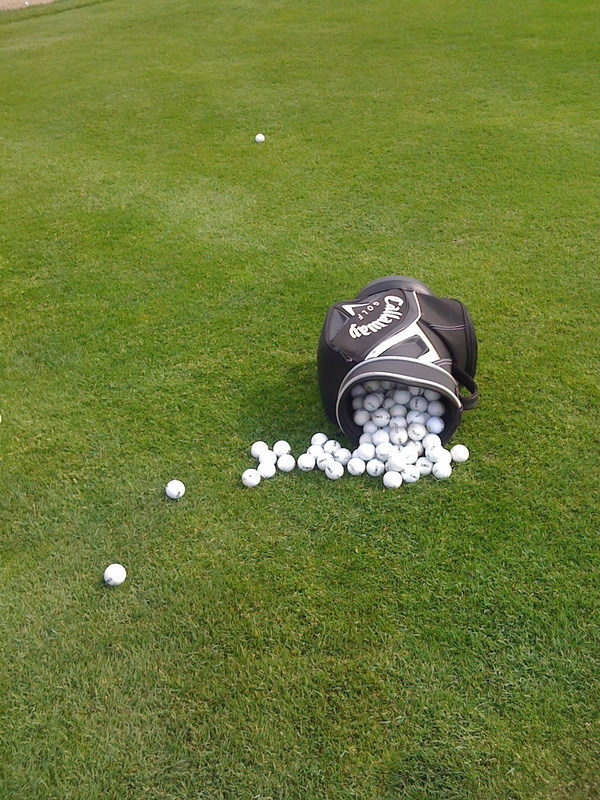 I was at the practice tee this evening and it was a line of very happy golfists. Which lead me to think, what fine wives we have who let us enjoy this greatest of activities. While golf marriages don’t have to be legalized, they really need to be recognized as a double plus good positive thing. When a friend fretted about playing on Friday, then Saturday, then putting in our matchplay event on Sunday morning, I pointed out that our dear club won’t be having such another grand reopening again for a long, long time, and so it would be cruel to have him not participate in what is surely an historic event. Deny that man golf, and he’s sure to start fantasizing about other women and Porsches.